The O’Brien family of Independence is mourning the death of Jeffrey O’Brien, 23, who was viciously attacked and killed by three dogs, two of whom are ferocious pitbulls, while he was riding his bicycle to his home, from the lagoon, on the public road in Independence. Jeffrey’s brother, Police Constable O’Brien (no first name given), told Amandala that at about 10:30 Saturday night, Jeffrey came in from fishing, pulled up and secured his boat by the lagoon, and was riding home on his bicycle with his fish, net and his paddle, when three dogs rushed out of the unfenced yard of Wilson Hernandez, 27, and attacked him. O’Brien tried to defend himself, and hit the dogs with his paddle, but it broke, and the dogs – two pitbulls and a large “potlicker” – tore off his shirt and mauled him, biting his face, throat, hands, chest, and other parts of his body. Hernandez, the owner of the dogs, is a watchman for the property of Hon. Senator Joy Grant, Minister of Energy, Science & Technology and Public Utilities. He told Amandala that at about 10:40 Saturday night when he came home, he saw O’Brien on the ground on the road, in the area of his house, bitten on various parts on his body by the dogs, hanging onto life. Hernandez rushed to the Independence Polyclinic and brought the ambulance, which took about 15 minutes to reach O’Brien. The paramedics tried to revive O’Brien, but it was to no avail. He was dead. O’Brien was taken to the Independence Polyclinic, where he was declared dead on arrival at about 11:00 that same Saturday night. O’Brien’s body was taken to the Southern Regional Hospital Morgue in Dangriga, where it awaits a post-mortem to certify the cause of death. Jennifer O’Brien, Jeffrey’s mother, said that her son usually went fishing and had to pass through the area adjoining the unfenced property where the dogs were kept, which made him vulnerable to an attack. On Saturday night, she was at home when she was informed by her son, Constable O’Brien, that Jeffrey had been bitten to death by the dogs. They went to the polyclinic and saw him, with dog bites to the face, neck, arm and chest. Jennifer said that the dogs had attacked people before – in fact, a total of three persons had been previously attacked by the dogs. Initial reports to the family were that the watchman of the property, Hernandez, had gone out, and had left the dogs unleashed to guard the property, and these were the circumstances that led to the fatal attack on Jeffrey. Jennifer said that she wants justice. She wants the dogs to be put to death, and the watchman arrested and charged for the death of her son. The family said that they tried to contact Minister Joy Grant to request her assistance with the funeral expenses, but she has refused to see them, and has referred them to her attorney. Her watchman, Wilson Hernandez, insisted to Amandala that the dogs are his, not the Minister’s, and they help him to guard the property when he goes out or when he goes to sleep. He said that he regrets that he was not present when the dogs attacked O’Brien, because he would have been able to make them let O’Brien go. He did what he could to help – he went for the ambulance and helped the paramedics put O’Brien into the ambulance, he said. Hernandez recounted that when he arrived at the property, he saw the biggest of the dogs, a pitbull, with blood all over its face. He knew that he was the most ferocious of the lot, and knew that he was the one who had attacked O’Brien. He believes that although the others also attacked, it was that particular dog which caused the fatal injuries to O’Brien. The other pitbull is a female, who is pregnant. 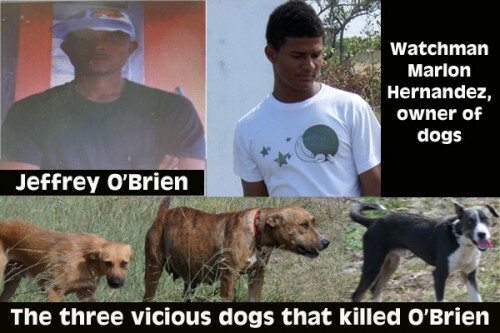 Commenting on the request of O’Brien’s mother that the dogs be put to death, Hernandez said that he would not like to see the other dogs killed, but would have no problem if the big dog was put to death. Jennifer O’Brien said that she will miss her son, because he had helped to take care of her. He was a fisherman, he cut the yard, he worked at the shrimp farm, and he did construction work. When he went fishing, he brought home fish for her. When he sold fish, he gave her some of the proceeds of his sales. Jeffrey O’Brien is survived by his mother, Jennifer, two sisters, six brothers, including Constable O’Brien, and a host of relatives and friends. Amandala extends condolences to the O’Brien family, and thanks PC O’Brien for his assistance in Independence.